Marius Dadarlat is a Professor of Mathematics at Purdue. He received a PhD in mathematics from UCLA in 1991 and has been on the faculty at Purdue since 1992. Marius works in Operator Algebras, a branch of mathematics that emerged from the mathematical formalism of quantum mechanics and which now plays a central role in non-commutative geometry, a mathematical theory that proposes a reconstruction of the general concept of space that is better aligned with the principles of quantum physics. His research devoted to topics in operator algebras, geometric group theory, K-theory and non-commutative topology and geometry has been continuously supported by NSF since 1993. 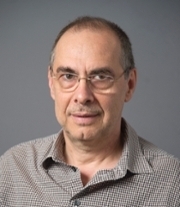 Marius served as an editor for Transactions of American Mathematical Society and is now an editor of the Journal of Homotopy and Related Structures, the Illinois Journal of Mathematics and the Journal of Operator Theory.